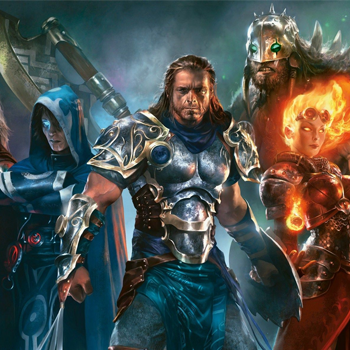 Last year 20th Century Fox grabbed up the movie rights to Magic: The Gathering with eyes on turning it into a theatrical franchise a la Lord of The Rings or the upcoming WarCraft. Now they've hired Bryan Cogman, a producer and story editor for HBO's Game of Thrones, to draft a screenplay for the inaugural installment. The film will be produced by Simon Kinberg, Brian Goldner and Steve Davis. As this is the first official movement on the product since Fox secured the rights, no casting, director or story details are yet available. Kinberg is best known as the writer/producer of the three most recent X-Men movies, and also scripted Disney's upcoming live-action Cinderella for Kenneth Branagh and Josh Trank's Fantastic Four reboot. Created in 1993, MTG is one of the most popular trading-card games of all time. Its storyline involves a Multiverse of individual worlds traversed by powerful beings called Planeswalkers, who combat one another using spells and summoned creatures powered by lands of varying geographic type under a Planeswalker's control. The game features a detailed cosmology and mythos, which is expanded upon by officially licensed novels and comics.